"FIVE STARS! With melodies and harmonies that evoke those of America, The Byrds and early CS&N, the Kentucky-bred duo of Ken Marvin and Brian Gentry show off their very own skills crafting listener-hooking turns of phrase and choruses one is singing along with on the second go-round. Airplay-worthy tracks abound including "Wishful Thinking", "Without You" and "Great Divide". Production is first-rate." 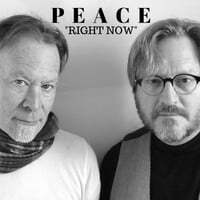 Originally recorded and released in 1997 by Peace (Dan Peek, Ken Marvin and Brian Gentry). This is a brand new digitally remixed and remastered version with Paul Winkler (drums), and additional backing vocals by Marvin & Gentry. Engineered & Mixed by Chris Brush (Nashville. TN).